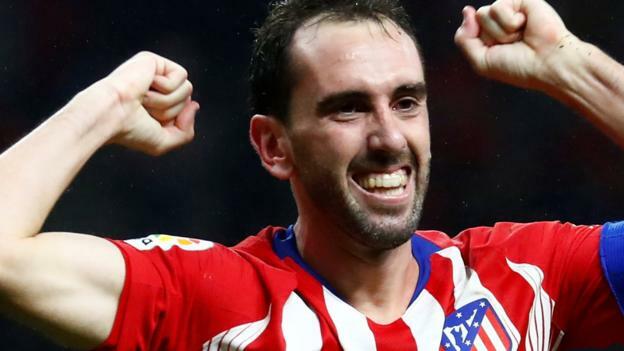 Diego Godin scored an injury-time winner as Atletico Madrid twice came from behind to beat Athletic Bilbao and move up to second in La Liga. Atletico captain Godin was carrying an injury and ran away limping in celebration of his 91st-minute header. Rodri had brought Diego Simeone’s side level 11 minutes earlier, cancelling out the second of Inaki Williams’ two goals for struggling Bilbao. Atletico’s Thomas Partey earlier scored a long-range strike to level at 1-1. The injured Godin only stayed on the pitch because his side had already made the maximum three substitutions and he could not be replaced. He hobbled into the box to contest a late free-kick and converted the winner from close range, with the goal initially ruled out for offside but then awarded via the video assistant referee. The result moves Atletico one point behind leaders and defending champions Barcelona in the Spanish table while leaving Bilbao 17th, outside the relegation zone only on goal difference. Victory for either Sevilla or Espanyol in their 17:30 GMT meeting on Sunday will see them climb above Atletico and into second place. Barcelona can extend their lead at the top when they play at home to Real Betis at 15:15 GMT.